The year was 1985. Linda Dalo wanted to spend more time with her five-year-old daughter. Cecilia Jordan was expecting her first child and worried about balancing a family with a full-time job. Both women were at a crossroads in their administrative careers when they approached Professor John Corliss, then chairman of the Department of Zoology, with an interesting proposition. They wanted to share a job in the department’s undergraduate office. To further provide continuity, the two would meet for lunch each Wednesday, a tradition they continue to uphold. “We have a wonderful friendship that has grown over the years. We’ve seen each other through a lot of changes, personally and professionally,” says Dalo. Their common bond: “We enjoy working with students. After nearly 30 years, it has been so gratifying to see so many students leave the college and pursue successful careers,” adds Jordan. Nine years ago, Dalo took a full-time position as a program management specialist in the CMNS undergraduate academic program office, working closely with Joelle Presson, assistant dean for undergraduate programs. Jordan remains as a program management specialist in the biology department, which now encompasses zoology. For the last four years she has taught UNIV 100, the freshman orientation course, during the fall semester. Throughout the years, their commitment and dedication to students, the college and the university has not gone unnoticed. 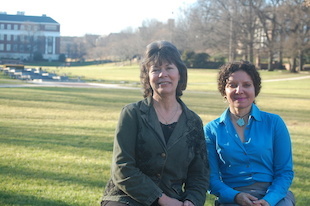 Both women have received the college’s Staff Excellence Award. In 2008 Dalo received the President’s Distinguished Service Award, and in 2005 she received the Board of Regents Staff Award, an honor Jordan received in 2011.